While Irish people struggle to survive crippling taxes and cuts, it has emerged that foxhunting groups (whose members can splash out on expensive horses and four-wheel drives) are continuing to enjoy tax exemption. The hunting groups are included in the latest Revenue Commissioners list of "sporting bodies" which have been granted tax exemption under Section 235 of the Taxes Consolidation Act, 1997. The current Revenue list of exempt groups contains eight hunts (as well as a number of animal shooting groups). The hunts are: Carbery Hunt, County Limerick Hunt, County Roscommon Hunt, Fingal Harrier Hunt, Laois Hunt, Shillelagh And District Hunt, Island Hunt and United Hunt. As Section 235 deals with "bodies established for promotion of athletic or amateur games or sports", the Irish Council Against Blood Sports is renewing its call to Revenue for hunting groups to be rejected due to the fact that they do not fall into the categories of athletic, amateur game or sport. Fine Gael Minister for Finance Michael Noonan has shamefully defended the exemptions, outrageously arguing in 2013 that the "ordinary meaning" of sport includes activities such as hunting and therefore hunts can benefit. "It's disgraceful that Revenue views the terrorisation and killing of Irish wildlife as a sport or game," ICABS stated in an email to the Games & Sports Exemption Section. "Revenue granting tax exemption to hunting groups is most inappropriate and highly offensive to the Irish majority who want this deplorable activity outlawed. We urge you to recognise that hunting is NOT a game or sport and to withdraw the exemptions for hunting groups." Part of the application form for tax exemption which asks the applicant to specify the "athletic or amateur game or sport". Foxhunting is animal cruelty, not a game or sport. Please join us in urging the Revenue Commissioners to recognise that hunting is not a "sport" or "game" and to reject applications for tax exemption from hunts. 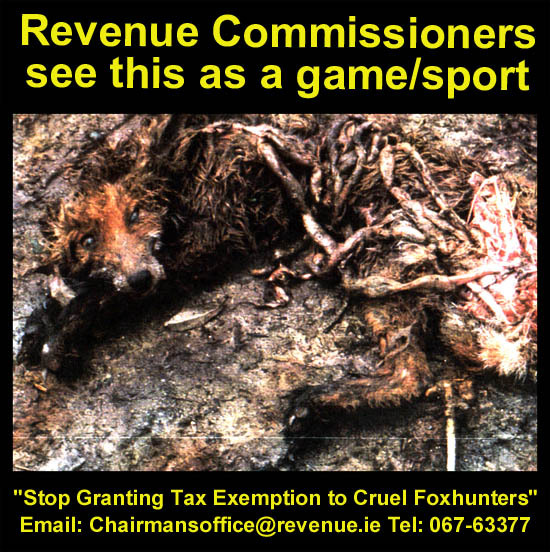 Groups promoting blood sports "entitled to a tax exemption"
Fine Gael Minister for Finance Michael Noonan has said that groups that promote hare and fox hunting are "entitled to a tax exemption". Responding to a Dail Question from ICABS President Maureen O'Sullivan, the Limerick TD outrageously claimed that the "ordinary meaning" of sport includes activities such as hunting and therefore hunts can benefit under Section 235 of the Taxes Consolidation Act 1997. Section 235 deals with "bodies established for promotion of athletic or amateur games or sports". ICABS is calling for hunting groups to be rejected due to the fact that they do not fall into the categories of athletic, amateur game or sport. We are urging the Finance Minister and the Revenue Commissioners to recognise that terrorising and killing animals is not a "sport" or "game" and to reject applications for tax exemption from hunts. As of 9th August 2013, the Revenue list of tax exempt groups contains eight hunts (as well as a number of animal shooting groups). The hunts are: Carbery Hunt, County Limerick Hunt, County Roscommon Hunt, Fingal Harrier Hunt, Laois Hunt, Shillelagh And District Hunt, Island Hunt and United Hunt. As the legislation does not define what is meant by the term �sport�, it has to be given its ordinary meaning. In that context, it has been regarded as including pastimes collectively undertaken for recreation purposes provided such activities are legal and considered by convention and custom to be sporting activities. These include field sports such as hunting, shooting and fishing. As the latest budget claws cash from the sick and the poor, foxhunting groups whose members can afford expensive horses and four-wheel drives are enjoying tax exemption. A list recently published by the Games and Sports Exemption section of the Revenue Commissioners� website reveals that hunts were granted exemption under a section of the Taxes Consolidation Act dealing with �bodies established for the promotion of athletic or amateur sports�. Most people recognise sports as activities in which individuals or teams compete against each other but Minister Michael Noonan and Revenue accept a different definition. They are maintaining that riding after a pack of dogs as it chases a terrified fox and tears it asunder constitutes �sporting activity�. Foxhunting is animal cruelty, not sport. This outrageous exemption must be scrapped.